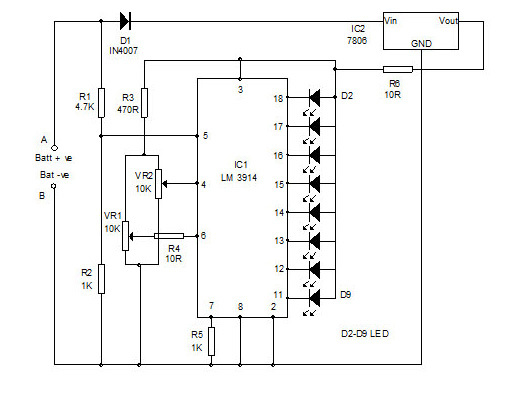 The circuit uses the popular display driver LM 3914 to give the LED meter reading. Input voltage is applied to the IC from the battery terminals through R1.The lowest reference voltage is set as 10.5 volts and highest level as 13.8 volts. Variable resistors VR2 sets the lower voltage level and VR1 sets the upper voltage level. To set the meter, a variable power supply is required. LM 317 based 1.5-30 volts variable power supply is a good choice. Adjust the output of the variable power supply to 10.5 volts and check it with a digital multimeter. If it is ok, then connect points A and B to the variable power supply and adjust VR2 till D2 lights. This is the lower level. Then adjust the variable power supply to 13.8 volts. Slowly adjust VR1 till D9 lights. This is the upper level. You can also calibrate the steps of voltages between 10.5 and 13.8 in the similar way and mark the voltage level at which each LED lights. Now the meter is referenced between 10.5 and 13.8 volts. Connect it with the battery using Crocodile clips. 4. LED do not require a series resistor since the IC can regulate output current according to the value of the Programme resistor in the pin 7. 10. To get more brightness to LED, value of the programming resistor should be below 1K. If the value of the programming resistor is 560 ohms, the current through the LED is 23.5 milli ampere which gives sufficient brightness. Current should be between 20 to 30 milli ampere. Why you use resistor with variable resistor? Often we want to easily change a resistor value, so we use a variable resistor. For example, we may want to change the resistor that controls the power sent to a LED, so we can easily make it brighter or dimmer. Often if we use a variable resistor, there is only a very narrow range that is useful. Continuing our example, sometimes we use several LEDs, and we use the variable resistor to set them all to the same brightness. In this case, the resistance range that sets the LED to be twice as bright as the the other LEDs, and the resistance range that sends so much power to the LED that it is permanently destroyed is even less useful. So we add a fixed resistor in series with the variable resistor — the fixed resistor sets the minimum net resistance, no matter how we turn the knob on the variable resistor. In our example, the addition of the fixed resistor allows us to turn the variable resistor throughout its whole range, and the LED gets brighter and dimmer; without that resistor, a certain range of the knob on the variable resistor would allow so much power to go to the LED that it would be destroyed.